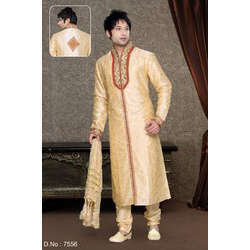 Pioneers in the industry, we offer mens designer sherwani from India. All Over Machine (Thread Work) On Front Border, Collar, And Cuffs With Touch Up Of Hand Work Like Cutdana, Stones, Tikki and patch Work Gives A Charming Effect. Mens Designer Sherwani Collections is Made To Measure Size 36 To 44 and Extra charges would be applicable for Sherwanis above 44 inches If matching stole or mojris are desired with the outfit, then additional charges would be applicable.Rate For Mataching Mojri(Shoes) Rs.800/- and Matching Pagri(Turbans) Rs.1100/- & matching Duputta (Stole) Rs.600/- it will take 25 Days to Deliver .So pls Mail To All other Accessories are for Photography purpose and There might be slight color variation due to lightings & flash while photo shoot. The bright shade seen is the best closer view of fabric's color.